The opening ceremony being filmed for Spanish TV in front of the Support Building. 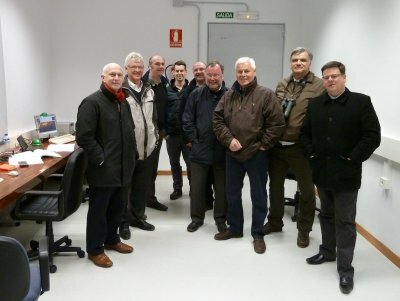 Left to right: Prof Mike Bode (Director of LJMU ARI), Prof Nigel Weatherill (LJMU Vice Chancellor), Prof John Beckman (IAC), Snr Yeray Rodriguez-Rodriguez (Mayor of Garafia), Prof Francisco Sanchez (Director IAC), and Nayra Rodriguez Eugenio (Spanish Educational and Outreach Programmes with LT). The LT itself is at right. 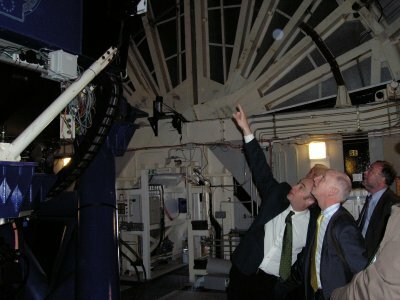 A new addition to the LT observatory site has recently been completed and officially opened by the Vice Chancellor of Liverpool John Moores University (LJMU), Professor Nigel Weatherill, in an inauguration ceremony held on 3rd May 2012. The Support Building is a multi-purpose structure comprising a workshop, storage and office/research facilities. The Support Building's workshop provides assembly and commissioning areas for new instruments prior to installation on the telescope, and also acts as maintenance facility for existing instrumentation and telescope hardware systems. 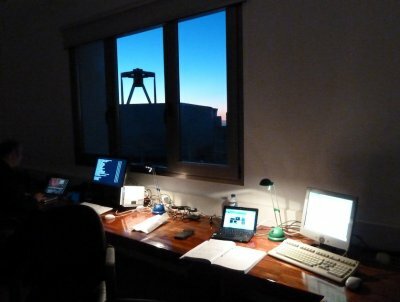 The control room and office is for the benefit of personnel visiting the site on the occasions it's necessary to actually have someone in-situ to commission and test new instruments, and when performing service revisions in existing instrumentation and telescope hardware. The building also has ample storage facility to house important spares and installation/lifting equipment for the operational running of the telescope. This will facilitate quick turnaround times on the occasions when part replacement is necessary, and therefore keeping off-sky time to a minimum. The new building is some 20m long by 5m wide, situated 10 metres south of the observatory building and connected by fibre optic links to the multiple computer racks in the telescope building, to allow full control of the telescope from the support building office when on-site commissioning of new instrumentation is required. The inauguration ceremony was performed by the Vice Chancellor, who was there with Director of the University's Astrophysics Research Institute (ARI) Professor Mike Bode, and LT Director Professor Iain Steele. Also present were LJMU pro-vice-chancellors Steve Kenny and Allan Bickerstaffe, Dean of Faculty of Science Peter Wheeler, Director of Infrastructure Services Colin Davies and Estates Project Manager Martin Christie. 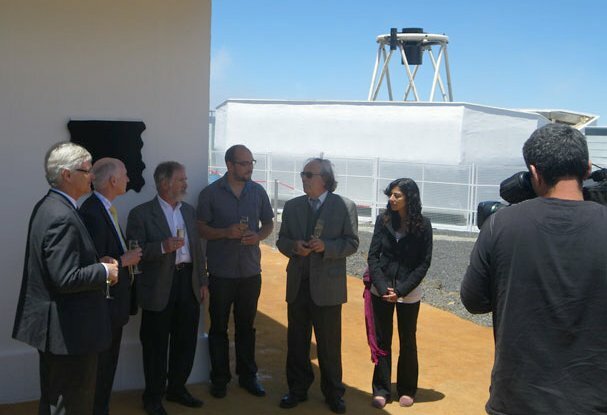 In all over thirty people were at the ceremony, the list of attendees including but not restricted to LT group personnel, representatives from the other telescopes on the Observatorio del Roque de los Muchachos (ORM), the ORM manager Dr. Juan Carlos Perez, the mayor of Garafia Sr Yeray Rodriguez Rodriguez, the support building's architect Sr. Gabriel Henriquez, and Sr. Jose Eloy Martin Canadillas from the building company. The new LT Support Building at left, with the LT itself at right. At centre is the LT's weather station, and a film crew from Spanish TV news. Later that evening, many of the visitors reconvened at the telescope to watch it routinely "come alive" at sunset with no need for outside prompting, and to begin observing autonomously - without human intervention. Afterwards the visitors took temporary manual control and made some observations for themselves. ARI PhD student Doug Arnold said "The evening observing session with the Vice Chancellor and other LJMU staff went very well. We started with solar system objects such as the Moon and Saturn, and moved on to globular clusters and galaxies. It was excellent to see a wide range of people at the opening. It was evident that the LT's operations are well regarded by the civil and scientific community." Telescope Director Prof Iain Steele inside the closed telescope enclosure, pointing out aspects of the LT to Prof Nigel Weatherill. At the end of the day the visitors met again to watch the LT in action and to make some manual exposures themselves. View of the LT at sunset from inside the Support Building's research office.